I posted a on the reptile site but it is not as popular as the AA I guess....anyone know a good reptile site. We have a 76 gallon aquarium that we are going to make into a terarium and I wanted to learn a bit about it BEFORE I go buy everything this time!!! My kids want geckos, we already have 3 hermit crabs and my son wants a tortoise. Can all this stuff live in there together?? Are there any other kinds of lizards that can live with geckos? Oh yeah, about the hermit crabs...They are the kind you buy at the kiosk at the mall (kids got them for Christmas from their uncle and they are still doing well) Anyways are they the same kind that people put into their fishtanks? I do put them in water for 3-4 minutes once a week or so (as I read to do on a hermie website). Just wondering if they are the same or a different kind. The website said to give them the bath to get them nice and wet and get their gills wet, but if they have gills how do they survive out of the water?? Wow...lots to answer. Well firstly, a tortoise, even the smallest sort require quite a bit more than a 76 gallon aquarium....they need a large indoor enclosure (starting in the 40" x 6' range and up) and an outdoor enclosure (ranging from 40 sq ft and up), as well as a lot of acre, time, etc...I really do not suggest them for anyone under 18 and without a lot of room. Gecko....any idea what sort of geckjo your son is interested in....there are dozens of common species, many very different in husbandry. As far as 'all this stuff living together'..no, not a chance. As far as other lizards that may live successfully with certain geckos...well, it will really depend on what gecko we are taking about. Oh yeah, about the hermit crabs...They are the kind you buy at the kiosk at the mall (kids got them for Christmas from their uncle and they are still doing well) Anyways are they the same kind that people put into their fishtanks? No....they are terrestrial, and will drown in short order. I do put them in water for 3-4 minutes once a week or so (as I read to do on a hermie website). Poor website if it did not tell you to give them only a few centimeters of water...again, these are a terrestrial species. The website said to give them the bath to get them nice and wet and get their gills wet, but if they have gills how do they survive out of the water?? Becuase they process atmospheric air, and although they require a reasonably high humidity, they do not need to be wet. Thanks for the info. I will have to research the geckos and lizards little more. The hermies are fun to watch. I do keep a wet towel over the top of the inclosure to help keep the humidity up (I live in Arizona, "but it's a dry heat" is the local joke.) So when I give them a bath am I really stressing them out? Should I keep the water at about 1/2 their body/shell depth? Or skip it altogether? They seem to like it and are very active durring and after the bath. Maybe they are worried about drowning . When we got them as a gift I googled some sites to learn how to keep them as I had no clue about them. I don't know what the sites were anymore. I will have to research the geckos and lizards little more. Well, feel free to ask any questions you may have....I have more knowledge in that are than in aquariums, even. So when I give them a bath am I really stressing them out? Should I keep the water at about 1/2 their body/shell depth? Precisely....and mist them a couple of times daily as well. ps. know any good reptile sites?? Specific ones, but most board types are lacking at best, or are filled with misinformation. As I said, feel free to ask me (either here or via e-mail...see my sig). Thanks, I'm sure I will have tons of s for you!! We are just beginning this adventure and have zero knowledge about it. My kids are 7, 7 and 4. They want geckos, do you have any specific suggestions that are good for younger kids? Nothing for the 4 year-old...really just too young. As for the 7 yearolds, about the only choice are leopard geckos or African fat-tailed geckos....both are very similar Eublepharine geckos that have modest space requirements, simple and easy husbandry, are quite hardy and long-lived (20+ years), and are very tractible and tolerate a reasonable amount of light handling....and are quite interesting to watch. Are their hearts set on geckos? And with a water dragon, you can have a really interesting set up/habitat for them that would be very visually stimulating. 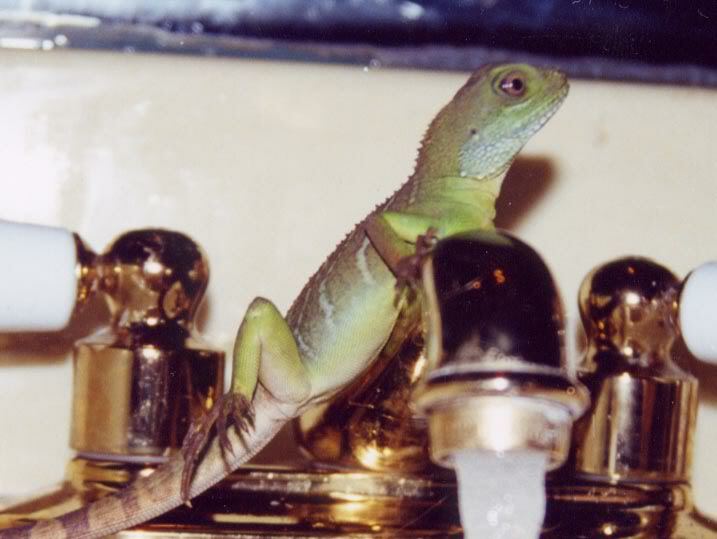 Water dragons are nice, but unless they are stunted, should get to a good 40"+ including tail, and that requires some serious room. For a space of about 5' x 3', your best bet would be a bearded dragon, as far as I am concerned, but they can be a bit much in the food and cost department for a first-timer.